Before their dishes tantalize your taste buds, these chefs use vibrancy and visual appeal to vivify your senses. Washington restaurants are filled with alluring, palate-meets-palette cuisine. These five are our favorite chromatic dishes: The sensual pan-seared Hudson Valley foie gras at Fiola Mare stands out in taste and color. Chef Fabio Trabocchi confidently takes this French classic from pure fat and salt to a variation that adds black mission figs and orange-scented jus to rock your palate and your eyes. Chef Marjorie Meek-Bradley’s St. Anselm, is one of the city’s newest and her vivid interpretations are getting noticed. The sinfully delicious buttermilk biscuits with pimento cheese look as good as they taste, but our favorite is the bright grilled carrots. Nicholas Stefanelli pioneered food in Union Market with Michelin-starred Masseria and is doing the same at the WharfDC with Officina. His dishes sing with a rainbow of colors, especially the Bue, 30-day-dry-aged beef with salsa verde, potato and bone marrow. 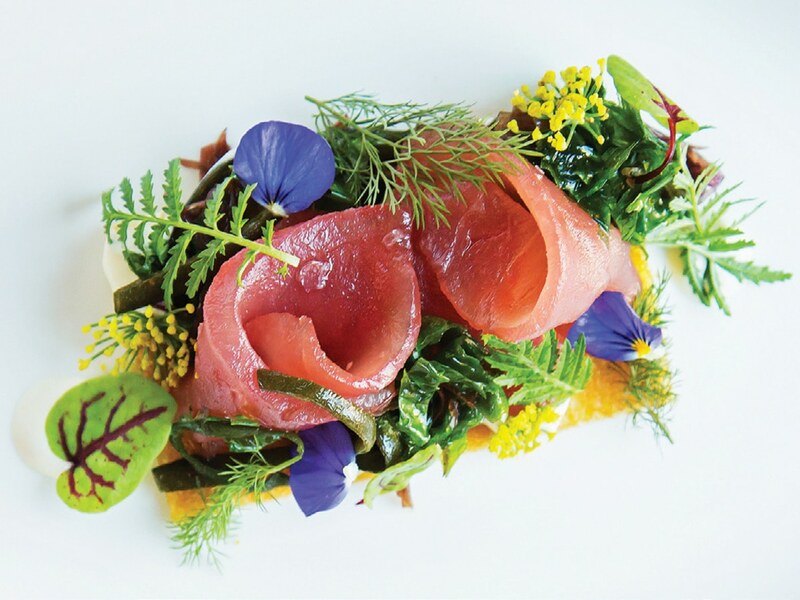 At Métier, chef Eric Ziebold is raising the vibrancy meter with the kaleidoscopic Métier Surf & Turf. “Lobster mushrooms are named so because they’re red, but in all honesty that is where their resemblance to a lobster ends,” he says. Paired with foie gras and sunchokes, they are rich in flavor and color. Finally is the prismatic Mi Vida, where executive chef Roberto Santibañez dishes out heaps of hues. The multicolored Tata nachos with crispy tortillas, black beans, melted Chihuahua and Oaxaca cheeses, salsa verde, crema and cilantro tops our list.